The sad Information of diver’s immolation in Lubumbashi was announced yesterday afternoon and it was really shocking to hear this happening again in this country (see the immolation video here). 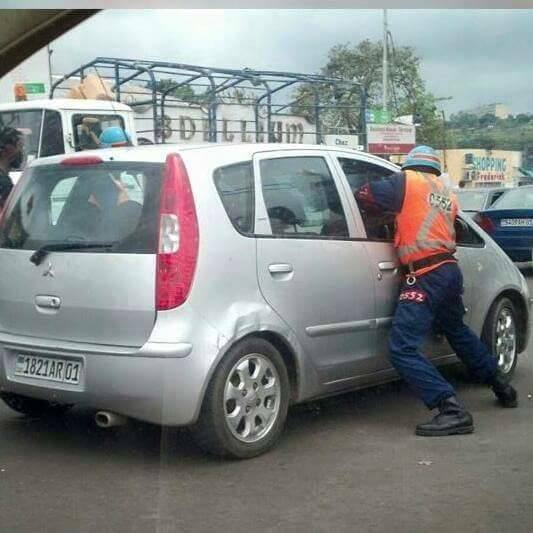 He tried his best to relentlessly defend his rights of driving in the Lubumbashi city. As he must have repeatedly come across these types of harassments, he couldn’t ever express it in another way than immolating and scarifying himself. Though unconceivable how he decided to sacrifice himself, it can however be understood for someone familiar with the functioning of our security services, especially the Traffic Police. The immortal act of Mwamba’s immolation has to be considered as a decision with only one bundle and choice; enough was enough. That’s, this was the only choice he has in his hand. How sad was that announcement for colleagues, the Lubumbashi city, the country in general; especially for his wife and children! It is not a story; the driver’s name is Mwamba. He was known among his colleague drivers. He has a family and probably standing as a unique responsible of their wellbeing. He was a parent of 7 children. Mwamba died in a unexpected situation while his background would have given him an opportunity to do more than taxi services. He might have been a Bank manager; though this won’t underestimate taxi services. He passed away on 29/10/2015 at 17h local time. Subsequently, his immolation and sacrifice MUST recall once again rulers to review the functioning of security services. The review would concentrate on the Police Nationale Congolaise (PNC) as they are mostly in charge of people’s safety on daily basis. Mwamba, #taximan immolé par le feu à #Lubumbashi est mort jeudi 29 oct à 17h. Brûlures graves. The viewpoint of the blog’s post lies in stressing that there are still much to do for reforming the Security Services to the extent of making it professional. The blogger believes that the overt attitudes of our security servicemen might not be the inner behavior characteristics of the Congolese society. It might be related to the way these guys are treated by the hierarchical structures. On one side, it may depend on the fact of running behind their own daily needs. Informed reader would unlikely contradict the fact that security forces are slightly remunerated; thus, they resort on a form of a predatory source of income (everyone in his jungle). Beyond that strange fact, there are people who believe that daily appointments of security servicemen are a function of what to deliver in terms of feedback to their superiors; which in turn becomes a model of rewarding. It remains hard to verify how these misconducts are entrenched with the in/formal structures. However, at some point, there are people stating to have been told that “you won’t accuse me anywhere as I have to report what I am asking for”. The statement above may sound as a caveat informing a claimer that if you think you will accuse a police serviceman/woman; just think twice as s/he may have received that mission. These two features can be considered at structural level. However, there might be individual’s weaknesses. Moreover, there is a possibility of misconduct due to individual challenges. The first one can be seen on the individual capacity of interpreting as well as executing a given mission. This depends on someone’s capacity to deal with unpredictable aspects of a mission. Informed reader knows how some guys within the security apparatus are brutal in executing their duties. We’ve come across security servicemen (re)acting unfriendly while it was a petty issue. In the same vein, we do sometimes have difficult to determine who is allowed to do what? It’s either intelligence forces, policemen or anyone else. The question becomes complicated to the point that identifying who is assigned to do what becomes a puzzle. The blogger thinks that the harassment that led our compatriot Mwamba to sacrifice himself is surely a generalized problem that requires attention from the high ranking of the security apparatus. It has also to be a political priority question demanding political leaders, especially the President to inquire on why these misconducts do regularly happen. Failing to do so contributes to widen the hole within the wall. Consequently, the reform needs to concentrate on these issues, starting by guaranteeing that our security servicemen are honestly treated.